New Years Eve at the Magic Kingdom includes two different fireworks shows, an electric parade, and a new years eve countdown to make a lasting memory with party hats and noisemakers. We present three different videos showcasing the New Years Eve Fireworks at the Magic Kingdom in Disney World. New Years Eve at the Magic Kingdom in 2014 is highlighted by the Holiday Wishes Nighttime Fireworks Show at 7:30 PM, the Main Street Electrical Parade at 6:30 PM and the Fantasy in the Sky Fireworks Show at 11:50 PM with Tinker Bell flying overhead from Cinderella Castle. Just prior to midnight, Mickey Mouse and Minnie Mouse can be heard getting the crowd ready to countdown to the new year which leads to another grand finale of fireworks choreographed to the traditional new years anthem Auld Lang Syne. The three videos below show the Magic Kingdom New Years Eve Fireworks from three different perspectives. The first video from nDisneyfreek is shown from Main Street USA. 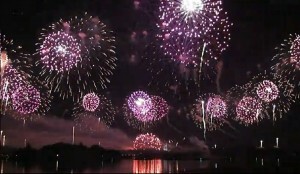 The second video from Mousesteps.com shows the perimeter fireworks from the Polynesian Beach Resort. The final video from Orlando Attractions Magazine shows the grand finale New Years Eve fireworks from a neighborhood behind the Magic Kingdom. The first two videos show the entire Fantasy in the Sky Fireworks show that ends around 7 minutes and 45 seconds into the video. The New Years Eve countdown begins in both videos around 8 minutes and 35 seconds. The final video is just the New Years Eve Fireworks. Click Here for our story on celebrating New Years Eve at Hollywood Studios and here for all of our coverage of celebrating New Years Eve at Downtown Disney. This entry was posted in Attractions and tagged december, disney world, fireworks, january, magic kingdom, new years eve. Bookmark the permalink.